It seems that these days there are 2 different makeup trends out there: the ultra heavy one with lots of conturing, based on old school techniques (a la Kim Kardashian style) where you get a complete makeover (and a mask like face where everyone looks the same) or the modern and fresh approach to makeup where you expose your features as they are with subtly enhancing the skin without looking overdone. Well, my approach has flipped through the years from the first one to the second one. 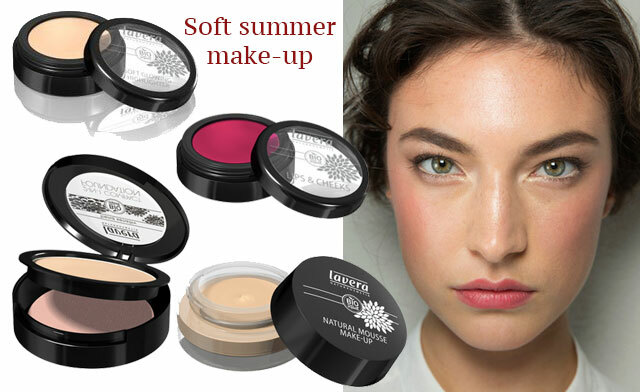 This is why I’m going to present you the fantastic new Lavera makeup line along with some tips & tricks how to wear and achieve a natural yet gorgeous makeup especially in summer days. Follow these steps to achieve that dewy look like you’d just hit the runway from Dolce&Gabbana! When talking about any makeup, not just the “modern” one, the most important feature to enhance is the face. 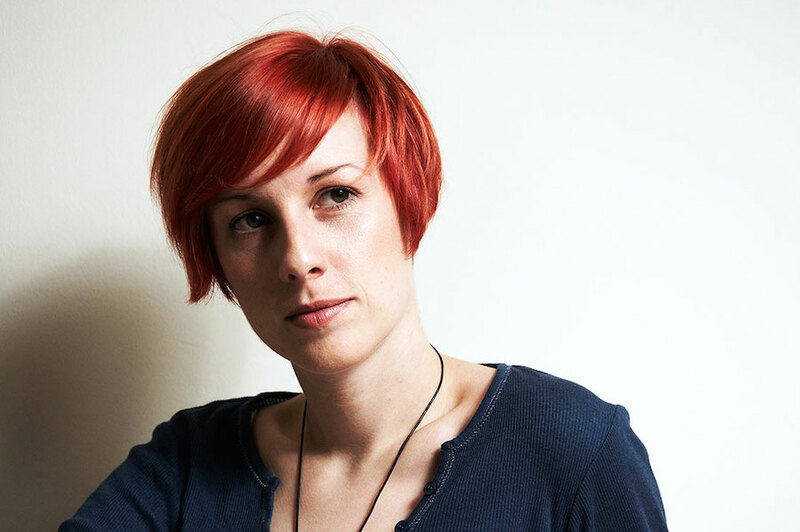 We have to give it a radiant healthy finish without looking overdone – like you don’t wear any foundation. And here I want to introduce you 2 fabulous foundations from the new Lavera collection: Natural mousse make-up and 2-in-1 compact foundation. 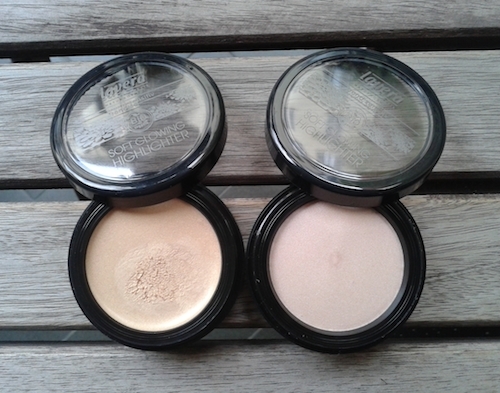 They are both in the category of light and seamless looking new era foundations. 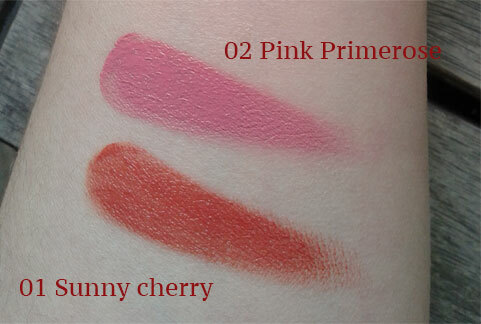 I have tried them first on myself and so I ordered them both in the shade n.01 Ivory. They both have a plethora of beneficial ingredients and oils, the only exception is one ingredient in the mousse which is a silicone (dodecane) which some of the greenest of you won’t like. I find the best way to apply them with fingers, but you can use a duo-fibre brush as well (this is the most suitable for this type of light foundations). I must emphasise my love for the new updated look and packages; they look beautiful, elegant and so professional as well! The first Lavera Mousse foundation is creamy and very light in texture and it gives you a matte finish although inside the glass jar it looks quite radiant shiny. 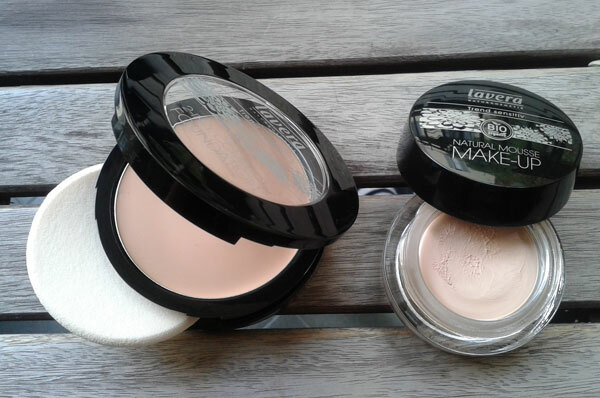 The coverage is quite good in comparison with the light texture, I’d say light to medium. It comes in 3 shades and the one I picked is suited for light skin and thankfully has a neutral undertone with a hint of yellow. 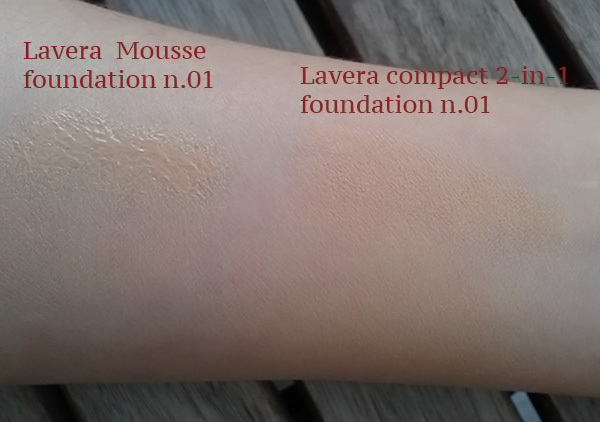 The second one Lavera 2-in-1 foundation blown me away! You might think about a cakey and heavy texture, looking too overdone; nope! It comes in 2 shades and it’s meant for touch-ups, but on myself I can use it easily alone. It comes in a gorgeous compact with mirror and sponge, but I prefer to use fingers which gives me more control and a small amount is needed. This one provides a matte finish with great coverage and looking like you don’t wear any make-up. It also covers my dark under eye circles so I need just a touch of under eye concealer which is great! The technology of both products amazes me, which is great that the green industry is improving so much! Green makeup tip Before applying any foundation take care of your skin with regular beauty routine and make sure to use a good moisturiser as a base. If your skin is flawless, you can use just a touch of concealer instead of any foundation. are the next feature to enhance with a touch of subtle color. This summer you can choose more vivid colours, like corals, oranges, pinks, but wear them with the rest of your makeup at minimum. They want to be the in the spotlight 🙂 Apply them with a small brush or the best with fingers and blend the color seamlessly into the skin. You can add what’s left on the brush/finger on your lips too. 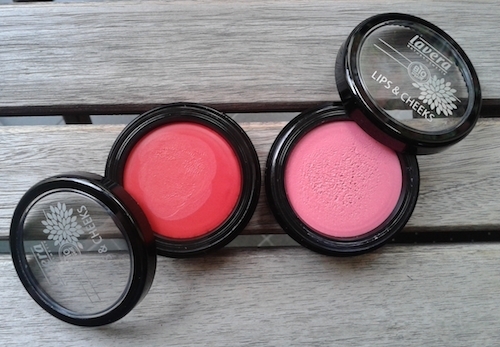 I love the most this new product from Lavera called Lips&Cheeks which comes in 4 shades. I have tried 2 of them and felt in love. As you can see from the picture, I already dabbed into the pink one my brush and it looked amazing on the model I worked with! The other one I applied on myself with fingers 🙂 The texture is creamy and non greasy and blends easily to achieve the fresh look. I love the awesome finish and great pigmentation. A little goes a long way and you can wear them as vivid lipsticks too! All shades are so modern and want to try the other two too! Thankfully, in the uber updated Ecco verde international online shop, you can find the entire new line from Lavera (and many other green brands as well)! And if you hurry I saw right now they have 10% off on all new Lavera makeup products! But stay tuned, because I have many more products to review for you from this new Lavera makeup collection! As for the products, I’m very curious about the foundations. For what concerns “dodecane”, I know that it may derive from coconut oil (distilled and hydrogenated), so it isn’t necessarily of petrochemical origin. Hehe thanks Mara! You always put a big smile on my face 🙂 oh, and thanks for your outstanding knowledge too, regarding the dodecane. Sounds great! I think in this case it’s derived from coconut. I must admit that recently I’m not so updated with all technical stuff so it’s great to have someone like you to help! Lavera looks so nice! I sooooo have my eye on that mousse foundation. Is it similar to the RMS un cover-up? because that’s sort of what it looks like in the pics. Great post! This was dangerous to read..i want it all! The Lip to cheeks look especially beautiful. Thanks for this! Love this post! 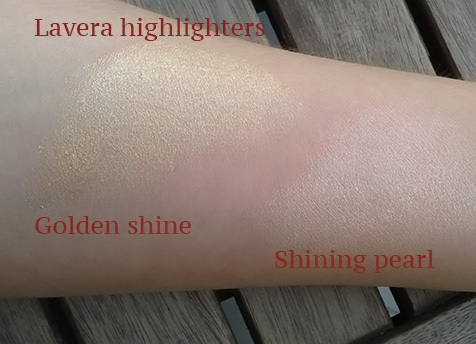 Those Lavera cream blushes look so good, I want them! Glad you like it 🙂 you should try these blushes they are awesome! Če pa je tvoja koža zelo mastna ti priporočam uporabo mineralnih pudrov v prahu/kamnu. I’ve been curious about the Lavera mousse but the dodecane makes me think twice. Some say it is coconut origin, others say it is still not safe despite its origin. In any case, it is not a silicone, it is a paraffin. Yes, I know that, but I wanted to try it anyway especially because I search a lot alternatives even for pro work that can replace conventional products.